I took what I fully expect will be the last trip of the season to brush snow off of the boat cover. More had accumulated than I expected, but it was still a tiny amount compared to previous debacles and it came off easily. I attempted to tighten up the lines, but the knots were frozen—it shouldn’t matter, since there will be no more snow. The water in the marina was also still frozen. I was curious about the state of the rest of the bay, so I drove down to Berkeley Island Park. The whole creek was ice, as well as the bay for as far out as I could see. The tire tracks [not mine] in the image above implied good judgment on someone’s part. I then decided to drive over to Island Beach. I was curious to see how much of the bay was frozen, and thought that a little snowy walk around the park might be nice. From the Route 37 bridge, I could see that there was some liquid water in the middle, but all of Toms River and most of the bay were still icey. I stopped just after the bridge and took a photo from the other side. While I was talking to the ranger at the gate to Island Beach State Park, I exclaimed, “There’s a fox! Right there! It’s a fox!” She was entirely nonplussed. Apparently they have a significant problem with tame-ish foxes, and she handed me a flyer about not feeding them, not getting out of my truck to frolic with them, etc. I drove down to the interpretive center, thinking that I could do a quick walkabout between the ocean and the bay. The path was completely pristine…no one had walked it since the snow fell. Along the way, I examined the flora like an armchair naturalist (i.e. with a genuine curiosity but notable lack of scientific rigor.) I present to you Ilex opaca; American holly. Paired with a nice teak, this would make for an excellent cabin sole. Not far in, the trail splits. I decided to go to the ocean first. The path toward the Atlantic was otherworldly in the snow. Contorted branches twisting toward the sunlight above the path allowed snow to collect on their topsides. Some fox tracks can barely be made out in the following photo. Some parts were snowier than others, and in places the trees and shrubs arched over the path like a cathedral. The woody plants stop abruptly and give way to grasses at the dunes. And, of course, beyond the dunes is the ocean. Looking north, you can almost get a sense of the steepness of these dunes. I’m not sure that I could have gotten down to the beach if I’d wanted to…or at least I’m not sure that I could have gotten back up. It was quite a steep dropoff, and higher than I remembered it from warmer days. To the south, Barnegat Light could be seen, just on the other side of the inlet. The snow on the dunes was weathered, leaving striations like rock formations in the high desert. I can’t be sure how deeply it drifted (I certainly wasn’t falling through it more than 6 or 8 inches) but some of the signs and fence posts were buried as if it were several feet deep. I appreciated the survival technique of this sign. The wind on the dune was strong and cold, so I retraced my steps toward the protection of trees. Now traveling west across the island, toward the setting sun, I tried to take some pictures of backlit icicles without it turning into a J. J. Abrams-style study on lens flare. The path to the bay is wider, and was also free of footprints (except for small animal tracks). This single reed somehow managed to get an inch of snow piled precariously on it. I might not have known that the bay extended all the way to the other side of these reeds if I wasn’t familiar with the area. 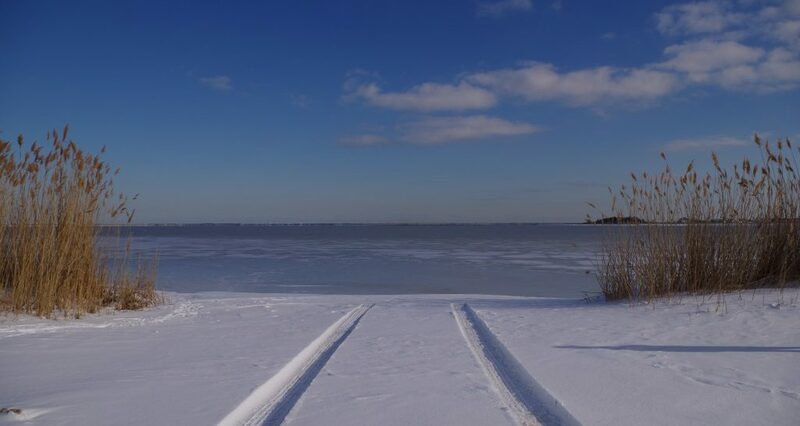 Johnny Allen’s Cove looked more like a snow-covered field than a brackish bay. I returned to my truck as the sun was setting, hoping to get a quick look at the bathing beach before I got kicked out of the park. It’s a little known fact that the Beach Boys were inspired almost entirely by the New Jersey vocal harmony act The Shore Lads, and the next photo shows the impetus for one of their most iconic singles, Thing Beach No. 2. If we can’t find beer we’ll have to drink bleach. …or perhaps the snow just comically graffitied the bathing beach’s sign a bit. The sign at the water’s edge was no less humorous to me. Still, there’s nothing like being on a beach with only your own footprints.